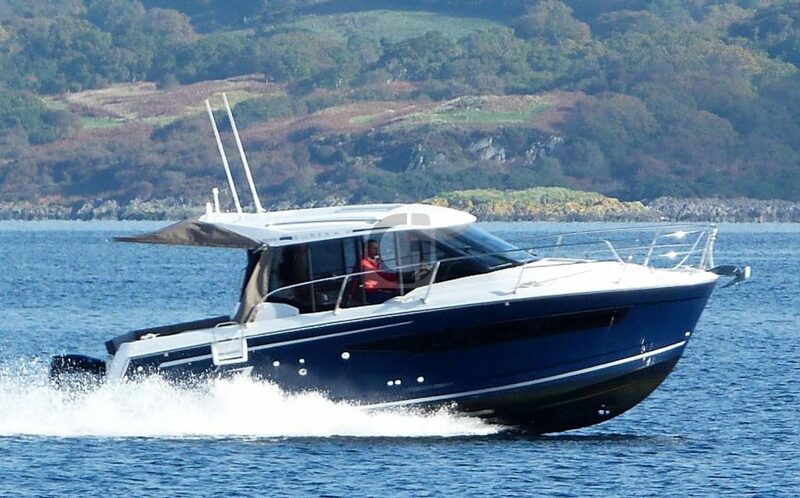 Grabau International is delighted to announce the listing of the 2017 Jeanneau Merry Fisher 895 ‘EUREKA V’. Very well-appointed Legend version of the Merry Fisher 895 benefiting from an inventory including Comfort and Premier packs alongside a number of further upgrades. The Merry Fisher range of fast fishers from Jeanneau has gained a cult following over the years and has become something of a speciality of the French builders. The New Merry Fisher range has taken the offering from basic utilitarian day boats to becoming attractive small weekend and coastal cruisers available in differing degrees of trim level. Aimed at the weekend user the Merry Fisher 895 is the full package, spacious practical accommodation below decks, a sea kindly hull and efficient modern petrol outboard engine. • Legend version of the model with blue gelcoat. • Comfort and Premier option packs installed. • Sliding Cockpit Seat L-shaped. • Saloon seating converts to occasional double berth. • Raymarine Axiom navigation system. • Full Cockpit Tent Enclosure. Very lightly used by the owner during this season she has only been slept on twice with the engine having recorded just 40 hours of running. She represents a real opportunity to acquire a fully loaded example of this current model boat at a considerable discount against buying new. ‘Designed for cruising, the new Merry Fisher 895 is a true weekender. She offers an incomparably bright interior, with wide windows in the helm station and even more comfort for those special shared moments on board. The cockpit features an L-shaped saloon, reclining seatbacks and armrests with cup holders. Both on the interior and on the exterior, the seatbacks pivot to adjust the seating to suit individual preferences. ‘Every country has its forte when it comes to boatbuilding, and with France it is fast fishing boats. The Jeanneau Merry Fisher 895 epitomises this concept well, offering this yard’s usual blend of practicality, robustness and performance. To be totally fair, this boat is not truly new. It is an incarnation of the previous MF 855 – which is no bad thing, as in creating the MF895, Jeanneau have taken a proven concept and made it that little bit better.